Ravenel’s Stinkhorn (Phallus ravenelii) is a common and widespread mushroom in gardens, lawns, meadows, cultivated areas, and woodlands of eastern North America. It is found from August through October, singly or in clusters, on the ground or on well rotted stumps, logs, wood chips, or sawdust. The fruiting body at first is white to pinkish and egg-shaped, resembling a puffball. When conditions are right the “egg” ruptures and expands rapidly, sometimes in as little as one hour, producing a 4″ to 6″ tall, distinctly phallic structure with a stalk and thimble-like head. The rapid expansion is possible because all of the parts are fully formed and compressed inside the “egg”, and because the individual cells elongate, rather than new cells being produced. As the stinkhorn expands the gelatinous layer mixes with the spore mass producing a shiny, putrid slime that covers the cap. The foul-smelling slime is irresistible to flies, which feed on it, lay their eggs in it, and transfer spores when they fly to other stinkhorns. Like all stinkhorns, this mushroom is edible. However, the slimy consistency inside the “egg” and the putrid odor the mature mushroom are enough to dissuade most from collecting it for the table. 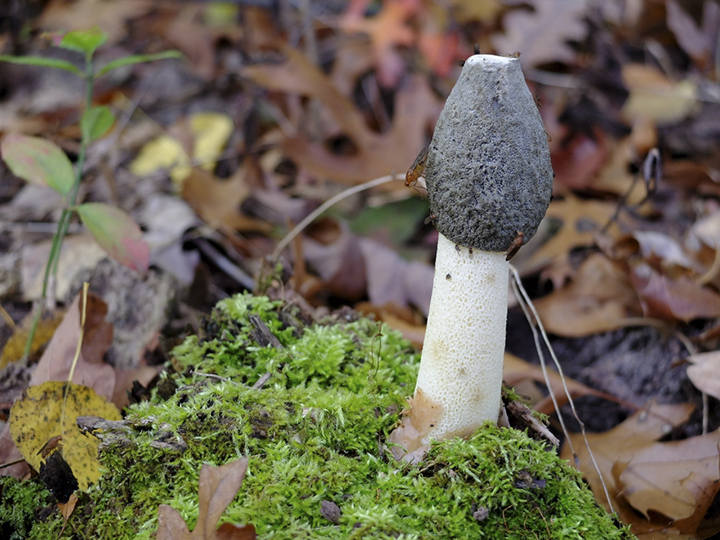 This entry was posted in Fungi and tagged Phallus ravenelii), Ravenel’s Stinkhorn on October 29, 2016 by John Valo. Crowded Parchment (Stereum complicatum) is a common, widely distributed, wood decaying, bracket fungi. It is found from spring through fall as fused masses or dense, overlapping clusters on stumps, logs, and sticks of hardwood trees, especially oak. The fruiting body is sometimes a thin, semicircular or fan-shaped bracket (cap), but very often it lies flat without a well-defined cap, with the margins free and folded inward. The upper surface is concentrically zoned with shades of orange, orangish-brown, tan, pinkish, or cinnamon. The under surface is bright orange and smooth, with no layer of pores or tubes. The flesh is thin, tough, and inedible. 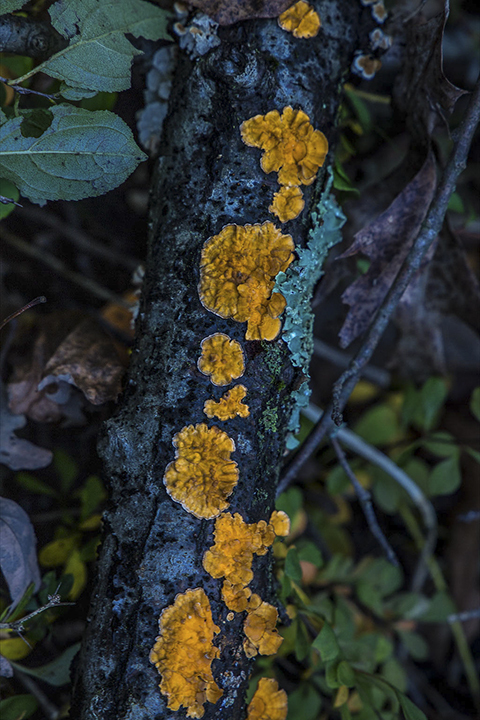 This entry was posted in Fungi and tagged Crowded Parchment, Stereum complicatum on October 21, 2016 by John Valo. Honey Mushroom (Armillaria mellea group) is a common and very widespread, extremely variable group of closely related gill mushrooms. It is found around the globe in the northern temperate zones and has been introduced in South Africa. 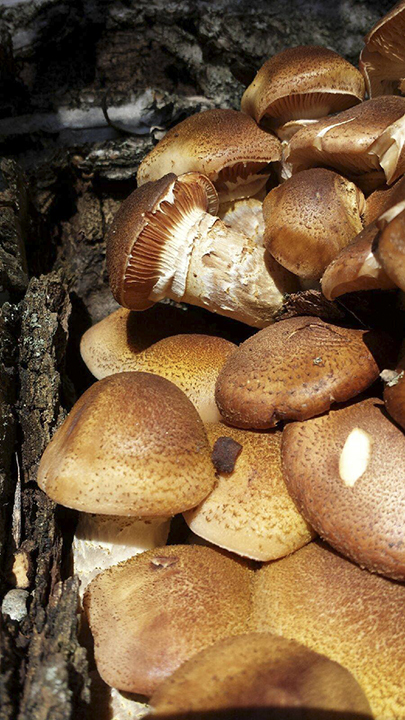 At least 14 varieties of Honey Mushroom have been described. Several characteristics are relatively constant. It usually appears in small to massive clusters on stumps or logs, on the lower trunk of living trees, or on the ground growing on tree roots. On young mushrooms the gills are covered with a Kleenex-like, cottony, membranous tissue. On the cap there are usually tiny brown scales, most dense in the center and more or less radiating outward. The stalk is tough, and fibrous, tapered to the base when in clusters, expanded at the base when solitary. The flesh is bitter when raw. The spores are white and white spore dust can be seen on lower mushrooms in large mature clusters. This entry was posted in Fungi and tagged Armillaria mellea group, Honey Mushroom on October 18, 2016 by John Valo. Long-spined Puffball (Lycoperdon pulcherrimum) is a beautiful, small to medium-sized puffball. It is found in the fall, alone or in small groups, on ground under hardwoods or on very rotten wood. It is common in the southern United States, uncommon in Minnesota. Long-spined Puffball is more or less pear-shaped, about 1½″ in diameter and 2″ in height. It has a globe-shaped top and a sterile, stalk-like base that is usually well developed but sometimes inconspicuous. 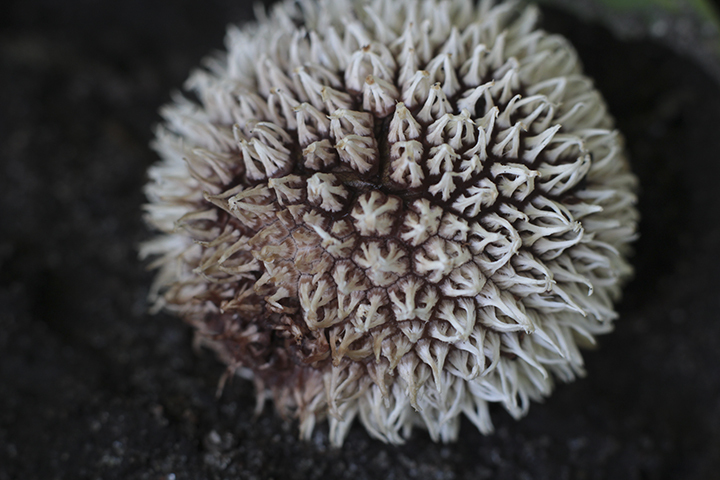 The top is white and densely covered with spines when young, dark brown to dark purplish-brown, shiny, and smooth at maturity. The slender spines join at the tips in groups of 2 to 6 or more creating numerous pyramid-shaped clusters. They remain white until they are shed or wear away, leaving no marks on the outer layer. When mature, a pore-like mouth develops at the top of the puffball through which spores are released by wind and rain. It is edible when it is young and the flesh is firm and white. Several spiny puffballs are found in Minnesota. Curtis’s Puffball (Vascellum curtisii) spines and outer layer remain white at maturity. It usually occurs in clusters. Gem-Studded Puffball (Lycoperdon perlatum) stem is substantial. The top is flattened and is covered with short white spines interspersed with white granules. The spines wear off by maturity leaving scars on the pale brown outer layer. Spiny Puffball (Lycoperdon echinatum) spines and outer layer soon turn brown, changing color together. This entry was posted in Fungi and tagged Long-spined Puffball, Lycoperdon pulcherrimum on October 11, 2016 by John Valo. Jack-o’-Lantern Mushroom (Omphalotus illudens) is a poisonous, bioluminescent, gill mushroom. It is found in woodlands growing on the trunk or stump of a hardwood, especially oak, or on the ground gaining nutrients from tree roots. It gets its common name from its bright orange color, its appearance around Halloween, and its eerie green glow in the dark. One report had it bright enough to read a newspaper by. More trusted sources suggest that the light is very faint and may not always be visible to human eyes. To see the light it is suggested that a person take a fresh, actively growing specimen into a closet, close the door, and wait 30 minutes for their eyes to become accustomed to the dark. Only then a will dim green glow be visible… or not. Jack-o’-Lantern Mushroom is usually small and found in large clusters, occasionally larger and solitary. The cap is yellowish-orange to orange. The flesh is more or less the same color as the cap. The gills on the underside of the cap are narrow, closely spaced, not forked, and emit a green glow. Chanterelle (Cantharellus cibarius) is similar in appearance but has a long growing season and can be found in the spring. It is usually solitary. The flesh is white. The gills are forked, shallow, and thick. 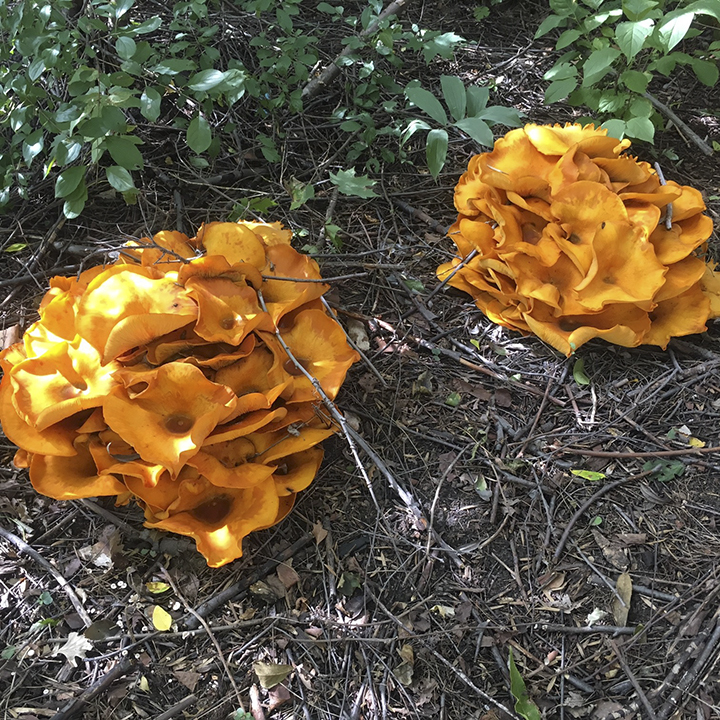 This entry was posted in Fungi and tagged Jack-o’-Lantern Mushroom, Omphalotus illudens on October 10, 2016 by John Valo. 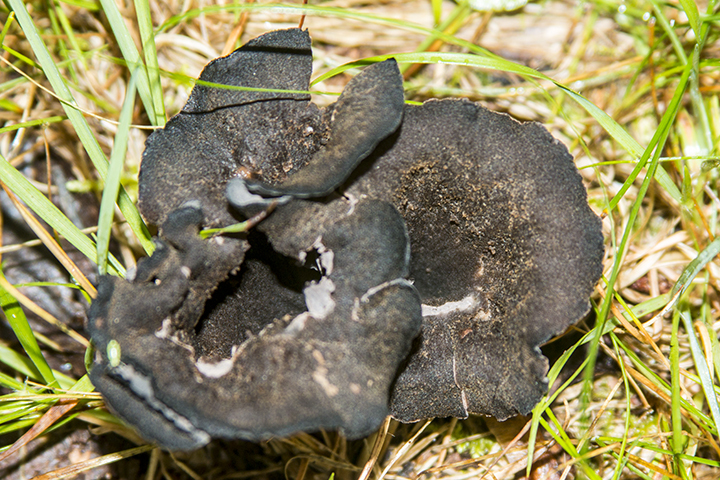 Black Trumpet (Craterellus fallax) is a common and widespread, edible mushroom. It occurs in deciduous and mixed woodlands across North America but is especially common in the east. It fruits from July to October on the ground, usually under oak, beech, and possibly other hardwood trees. It is often missed because its shape and color allows it to blend in with its surroundings. It sometimes stands out in sharp relief against a green carpet of moss. Black Trumpet is trumpet-shaped, hollow in the center, tapered to the base, dark brown to black above, and pale below. There is no sharp distinction between the stalk and the cap. It has a fruity fragrance reminiscent of apricots. Black Trumpet is distinguished by its blackish-brown, trumpet-shaped fruiting body; smooth or only shallowly wrinkled underside; and whitish to pinkish-orange or yellowish sport print. It is similar in appearance to three other “black trumpet mushrooms”, all of which are edible. Ashen Chanterelle (Cantharellus cinereus) has a bluish-black or bluish gray underside that is conspicuously wrinkled with shallow, primitive gills. Blue Chanterelle (Polyozellus multiplex) has a purple or dark blue tinted cap. Horn of Plenty (Craterellus cornucopioides) has a white spore print but is otherwise indistinguishable. It is common in Europe but much rarer in North America. This entry was posted in Fungi and tagged Black Trumpet, Craterellus fallax on October 8, 2016 by John Valo. 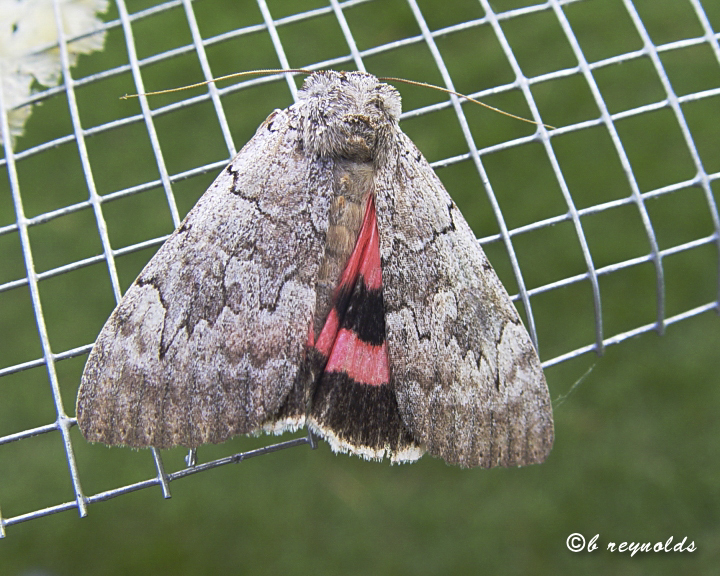 Pink underwing (Catocala concumbens) is a medium to large sized, strikingly colored, underwing moth. It is common from northeastern United States, west to the Upper Midwest, and north to Manitoba and Alberta. In Minnesota it is more common in the northern half of the state. Pink underwing adults are 1¼″ to 1½″ in length and have a wingspan of 2⅜″ to 3″. The forewings are a nondescript, mottled gray and tan with a pale, kidney-shaped spot and two thin, jagged, black lines. The hindings are pink two black bands and a wide white fringe. They are active at night. When at rest the wings are folded roof-like over the body. When approached or disturbed they spread their forewings revealing the startling color of the hindwings, possibly to scare off or give it time to escape a predator. There are 39 underwing moth species found in Minnesota, and most are similar in appearance. Pink underwing is distinguished by the pale colors and paler reniform spot on the forewings; and by the pink hindwings with a wide, straight, uninterrupted, white fringe. This entry was posted in Insects and tagged Catocala concumbens, pink underwing on October 1, 2016 by John Valo.